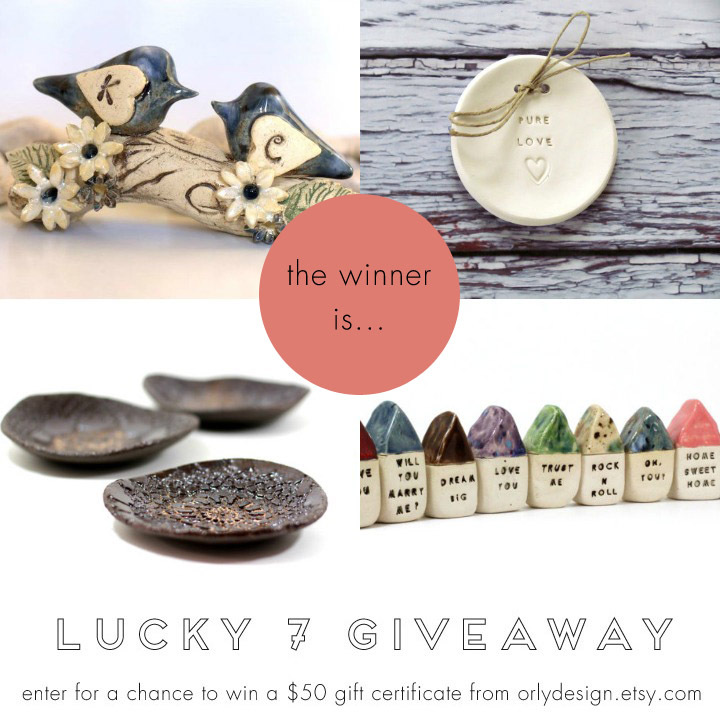 Our December Lucky 7 Giveaway featured Orly Design's ceramic shop + the chance to win a $50 gift certificate to Orly's shop. Did you have fun thinking about all the cool ways you could spend your gift certificate? Well, we're excited to announce that we have a winner! Using the random winner generator, we'd like to congratulate Nat H. ! We will be in touch with you via email. Congratulations! You've just been selected as our Lucky 7 December Elite16 Etsy Giveaway Winner. We can't wait to hear what you choose from Orly's shop! A BIG thank you to Orly for her participation in this month's giveaway and we can't wait to see you again next month! Just remember - Lucky 7! On the 7th of each month, we meet up here on the blog for a fun two weeks of giveaway madness! Our January giveaway is going to be huge! Stay tuned for details.